There is no easy answer to the question of how thick a concrete slab should be, because there are so many other questions that must first be asked. The first and primary question is, what is the concrete slab going to be supporting? The second question is only slightly less important, and that is, what do your local building codes require? Once you have determined the answers to those two questions, the rest is relatively easy. It is important to get it right when you pour any concrete slab, but it is imperative when you pour a slab for a foundation because everything else hinges on this and once it is set there is no going back. There are a plethora of building codes that address every aspect of concrete slabs, including the thickness required for the type of building you will be using it for. Information regarding code requirements can be obtained from the local city, county and state building codes department. Most professional contractors and can also provide this information. Although local codes may vary and should always be adhered to, industry standard thickness for a concrete floor slab in residential construction is 4 inches. One to two additional inches of concrete is recommended if the slab may have to support occasional heavy loads, such as a large vehicle. 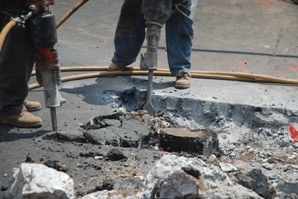 The concrete mix itself should meet compressive strength requirements of approximately 3,000 pounds per square inch or better. Higher compressive strength may be required for exterior slabs that are subject to below freezing temperatures. At its core concrete is a simple compound of sand, gravel and cement. This combination of materials, when mixed with water, creates a remarkably resilient solid mass. Although the basic idea behind concrete is simple, the underlying science can be quite complex depending on the compounds used for hydrating and binding. Varying combinations of each element produce concrete of differing strengths and tensile qualities. By adding a network of steel rods or rebar to the cement mix, the tensile strength of concrete is increased tremendously. Concrete is an ancient building material dating back to 5,600 BC. The Egyptians used concrete extensively in the 25th Century B.C. and the Romans improved on the technology by mixing volcanic ash to their traditional lime-based cement to create a concrete that was far stronger than earlier versions of the material. Portland cement, a common form of concrete still produced today, was first developed in the early 19th Century AD, and rebar was introduced in the 1850's. Both concrete and cement are derivatives from their Roman origins. Concretus was the Latin root for something that was grown together or compounded, while caementum indicated a rough stone or chipped fragment of a rock. The first concrete boat, constructed of an iron rod frame covered by concrete, floated in the Paris Exhibition of 1855. U.S. physicist, John W. Coltman, constructed a flute from concrete whose tone was indistinguishable from a similar cherrywood instrument, and Parisian jewelry designer, Patrice Fabre, introduced concrete as an element of her private jewelry collection along with gold and diamonds.